The Dallas Cowboys have a new home! The Star is where champions are made and championship teams will be built. This one-of- a-kind development is not only home to the Dallas Cowboys new world headquarters and training complex, but a 12,000-seat multi-use event center, and a wide range of mixed-use elements including dining, shopping and a hotel. If you’re making plans to check out The Star or visit The Ford Center at the Star, below are a few things you should know. The Dallas Cowboys share the Ford Center at the Star, the 12,000-seat indoor field, with high school football. One side of the Ford Center is dedicated to high school operations, while the other is for the Cowboys. This setup is the first of its kind for an NFL team. The Star features a members-only club, the Cowboys Club at The Star, which serves as a country club, but instead of a golf course, the main attraction is the ability to watch the Cowboys practice. Currently, all memberships are sold out. Included in the development is the 16-story Omni Frisco Hotel. Expected to be completed in the summer of 2017, this unique property features 300 Cowboys-themed rooms, meeting space, a ballroom and a rooftop pool overlooking a plaza area. The Cowboys teamed up with Baylor Scott & White Health to have a nearly 300,000-square-foot, nine-story facility at the headquarters. Set to open in late 2017, the first phase will focus on athletic performance, injury treatment and prevention and overall wellness. The coaches have their own mini practice fields which overlook the team&apos;s practice fields. Developed by a partnership between the Dallas Cowboys, the City of Frisco and Frisco Independent School District, student athletes will be a major component of the facility. Not only was the Ford Center built to accommodate High School football, but the complex will also feature student artwork and in some spots of the facility, Cowboys players will be paired with images of themselves in high school, along with relevant stats. 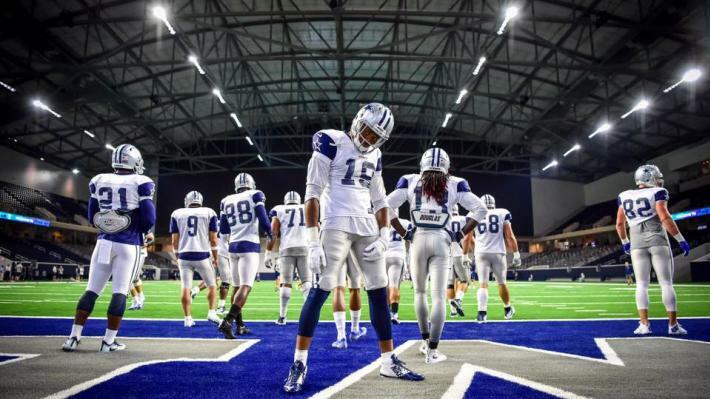 The Star features a variety of upgrades in amenities for the Dallas Cowboys. The team&apos;s locker room, which has curved walls in the shape of a football, features custom-designed lockers. There will also be a restaurant on site for all employees and players, as well as a state-of- the-art rehabilitation area which includes high-tech monitoring, saunas, training pools and one of the largest hot tubs ever built, and nicknamed "Lake Landry." 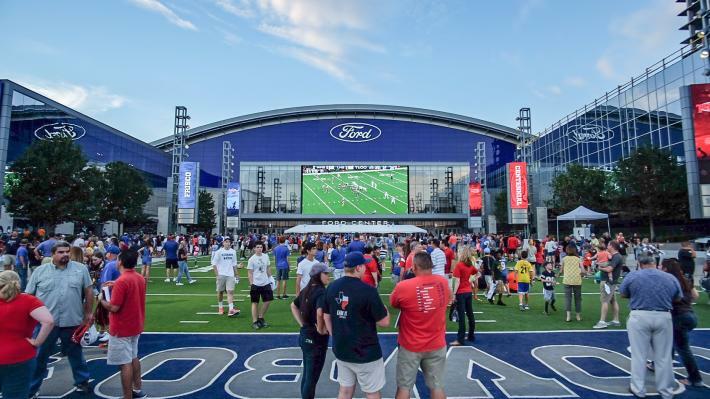 Ford Center: Ford Center at The Star is a state-of-the-art, 510,000 square-foot indoor athletic facility shared by the Dallas Cowboys, the City of Frisco, and Frisco ISD’s high schools. War Room: In 2017, the NFL draft will be conducted in this new state-of-the-art War Room designed with superior technology and fully interactive video wall. Nike Star Walk: Sponsored by Nike, the Nike Star Walk is a collection of the 10 most significant milestones in Dallas Cowboys history, along with a display of the evolution of the team&apos;s uniforms dating back to 1960. Super Bowl Memorabilia & Station: A display of all five Super Bowl Trophies and Rings from the years of 1971, 1977, 1992, 1993 and 1995. The Super Bowl Station is a complete collection of memorabilia from all five Super Bowl championships. Grand Atrium: In the Grand Atrium, with its beautiful Italian marble floors that are adorned with names and quotes of Dallas Cowboys players and coaches, hangs artist Leo Villareal LED sculpture titled “Volume Frisco" (2016). This dancing LED display includes more than 19,200 white LED lights embedded in 160, 40-foot-long, stainless steel mirrored rods hanging from the ceiling. Want to take the tour? Purchase your tickets here.